Front Row: Leslie Knipe, Alan McWilliams, Alan Walker, Sam Rountree and Jimmy Morton. We are a Tug of War team located on the outskirts of Armagh in the town of Richhill. Our biggest success in the clubs history came in 2008 when we won both the open and closed 560kg competitions in Faenza. In February 2010 we won the closed 560kg competition with 2008 puller Sam Rountree taking over as coach to lead us to our third world championships crown. Over the years there has been many nearly moments with 2006 being the closest as the team was narrowly beating by England in the final. There has been a lot of success on the local front with Richhill completing numerous clean sweeps and victory at UK level. 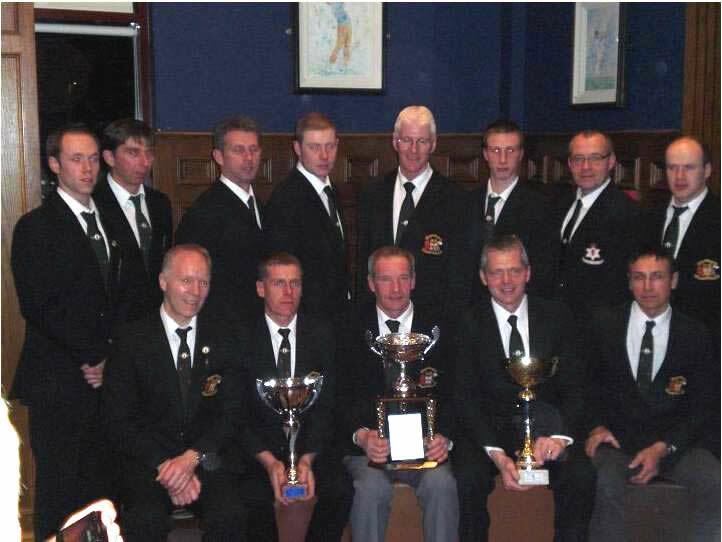 In 2010 Richhill successfully defended their crown as champions of the world, representing Northern Ireland in the 560kg competition. Northern Ireland progressed through the group stages of the Championship finishing second behind England after being blown out in both ends of the group stages. Scotland and Netherlands joined both Northern Ireland and England in the semi finals. With so much excitement leading up to the final, one had to wonder how it could live up to the ends that preceded it, but it did not disappoint. In the first end England pushed from the offset and slowly gained rope on Northern Ireland, however with them midway Northern Ireland stopped them in their tracks and began to take rope back, before they were taken the whole way and blown out following 3 cautions. Richhill were just one end away from winning back to back World Championships but with what had happened previously it was never going to be that simple. During the 2nd end there were 3 no pulls, every one of them being just like the very first end but fortunately Northern Ireland were able to sustain the pressure long enough to push England over the line. With that came an amazing achievement for Richhill, back to back World Championships for their country. A small panel of men from a small village in Rural Armagh went out onto the World Stage and proved once and for all that they are one of the top teams in the World, removing any doubt that they are a force to be reckoned with.